TAUNTON, Mass. – North Attleboro came into Thursday night’s Div. 1 South semifinal against top seed and unbeaten Silver Lake at Taunton High’s Jack Tripp Field as the heavy underdog. The Rocketeers were the No. 12 seed, had three freshmen in the starting lineup, including a freshman starting pitcher, and were playing their fourth game in seven days. When the Lakers jumped out to a 6-0 lead in the second inning, the game seemed like nothing more than a formality on Silver Lake’s path to the sectional final, but North did not go quietly and continued to battle all the way to the final out, making the top seed work for the win. In the end, Silver Lake had too much for North Attleboro, pulling out a 12-5 victory and setting up a match-up with No. 2 seed Milford in Saturday afternoon’s South final. Despite the defeat, North coach Bill Wallace was proud of how far his young team had come this season. The Lakers looked every bit the top seed with six runs in the first two innings. A two-out single by senior pitcher Jill Richards scored an unearned run in the first and in the second inning the Lakers sent 10 batters to the plate and brought home five runs, including a two-out, two-run single by senior catcher Emily Critch. Trailing 6-0 and with no hits through two innings, the Rocketeers could have rolled over and called it a spring, but instead North showed signs of life in the third and cut the lead in half. Freshman Ashley Cangiano (4-for-4) and junior Andrea Miceli started the inning with singles and freshman Abby Gallagher reached on an error to load the bases. The Lakers got the first out at the plate but senior Megan Barlow drew a walk to get North on the board. Senior Liz Morehouse followed with a two-run single off the glove of Silver Lake shortstop Caroline Videtto. The Lakers responded in the bottom half of the inning with another five runs to break the game open again. After freshman Bella Erti got a comebacker for the first out, the Lakers had five straight hits, including a two-run single by Videtto to make it 11-3 heading to the fourth. Gallagher got one back for North in the fourth with a sacrifice fly to left that scored Cangiano, who had somehow gotten to third on the play before with an unorthodox slide to avoid the tag. In the fifth, the Rocketeers got a fifth run with a two-out rally. Pinch hitter Amelia Murphy, who has battled injuries all season, reached on an infield single, took second on a wild pitch, and then scored on a single to center by Kristina Murphy. After a rough start, Erti settled into her start and, despite having pitched a complete game against Marshfield just a day early, seemed to get stronger as the game went on. She retired eight Lakers in a row between the fourth, fifth and sixth innings. In the top of the sixth, North had the chance to make things interesting when Cangiano and Miceli started the inning with singles, but Richards struck out Gallagher, Anna Battista chased down an Olivia Capobianco fly ball in foul territory, and Barlow lined out to second to end the inning. With two outs in the bottom of the sixth, Alexandra Ruprecht reached on an error. Two batters later, Hannah Mitchell singled to right center for an unearned insurance run. In the seventh, North continued to put pressure on the Lakers. Morehouse and Murphy each singled to get things started. Morehouse was forced out at third and Sam Courtemanche lined out to short before Cangiano got her fourth hit of the day to load the bases. Richards closed out the hard-fought win with a strikeout. While the night ended in defeat for North Attleboro (14-7), there is plenty for the Rocketeers to be optimistic about. Six of the nine starters will be back next season, including Erti in the circle. Oliver Ames, 5 @ Mansfield, 1 – Final – Oliver Ames senior Sam Burr allowed just four bases runners in six innings of work, striking out two to earn the win. The Tigers did the majority of their damage in the first inning, scoring four runs and adding one more in the fourth. Mitch Goulet went 3-for-4 with a double, an RBI and a run scored and Alden Newman had two hits, a stolen base and an RBI for OA. Attleboro, 1 @ Taunton, 11 – Final – Taunton belted out 16 hits as a team and senior Courtney Fisher struck out a season-high 11 batters as the Tigers secured a win under the lights at Jack Tripp Field. Eighth grader Hannah Aldrich led the way with four RBI on two hits, including a triple, while Jaime Brown, Liana Duarte, Kya Enos and MacKenzie Handrahan all had two hits and an RBI in the win. Katie Van Zandt drove in two more runs for the Tigers. Fisher allowed just three hits in the win. Foxboro, 1 @ King Philip, 10 – Final – With the win, KP clinched the outright Kelley-Rex division title. It is KP’s 10th league title in the past 11 seasons. Click here for photos from the game. Franklin, 0 @ Bishop Feehan, 1 – Final – Franklin junior Jackie Cherry and sophomore Ally Shea both played well for the Panthers according to FHS coach Kate Fallon-Comeau. Mansfield, 4 @ Holliston, 0 – Final – Sarah Cahill gave up only four hits to pick up the shutout. Mackenzie Burke drove in the first run in the first inning and Mady Bendanillo made it 2-0 scoring on a dropped third strike. In the seventh, Mansfield doubled its lead when Mady Bendanillo sinlged home her sister Kara and Megan Letendre scored on a groundout. Kara Bendanillo went 3-for-3 on the day to lead the Hornets offensively. Oliver Ames, 6 vs. Walpole, 9 – Final – Oliver Ames jumped out to a 5-0 lead in the first inning but were forced to bring around a sixth run in the fourth inning to knot the game 6-6. Walpole went on to score one run in the sixth and two more in the seventh to secure the win. Victora Ziner had a double and a run scored while Katie Abreu, Caroline Mahoney and Kayla Georgeu each knocked in a run and scored. Katie Mills added two RBI and Lexie Campbell plated Lizzie Miller for OA’s sixth run. Click here for photos from the game. Stoughton, 0 @ North Attleboro, 6 – Final – North Attlebor freshman Bella Erti fanned 10 batters while allowing six hits to lead the Rocketeers to a win. Olivia Capobianco cleared the bases with a double, Liz Morehouse and Kristina Murphy had two hits apiece and Ashley Cangiano and Katherine Munley each scored a pair of runs. Karly Estremera, Bri Ferrandiz, Shannon Flaherty, Jordan Lyons, Nikki Coppola, and Haley Stone had hits for the Black Knights and head coach Tim Norton said Loffredo had a good game in the field as well. Sharon, 0 @ Milford, 6 – Final (3 inn.) 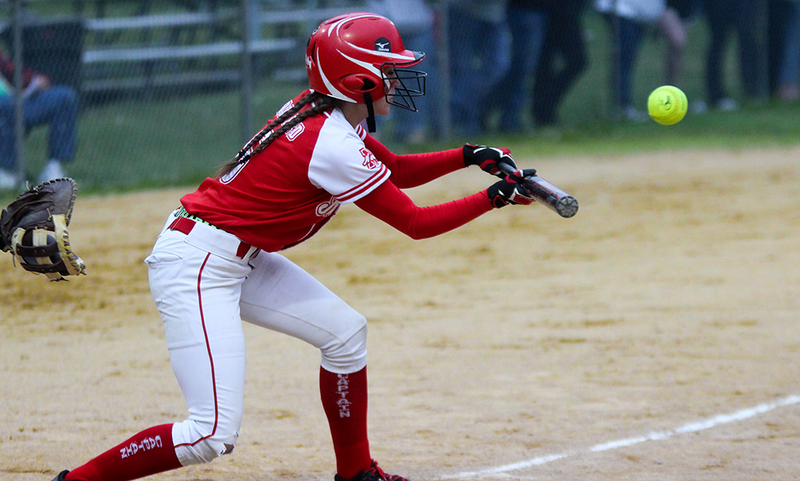 – Milford’s Jess Tomaso connected for a pair of singles and knocked in a run as Milford notched a win at home as the away team. Emily Piergustavo added a triple, an RBI and a run scored and Kate Irwin had two RBI. Ali Atherton struck out four in two innings of work. Stoughton, 1 @ North Attleboro, 14 – Final – North Attleboro’s Andy DeMattio deposited a hat trick and added one assist to lead the Rocketeers to their final league win of the season. Jack Dakin, Nick Ward, Jason McNeany (12 face off wins), Jack Connolly and Tommy Lindstrom each had two points, scoring once and recording an assist. Dan MacDonald scored once and had two assists while Damien Curtis, Owen Costello, Hunter Sarro, Zac Doucette and Ramssey Francois each scored once. North Attleboro, 16 @ Norton, 5 – Final – North had 12 different goal scorers to beat Norton. Camille Pizarro was the top scorer for North with three goals. Taunton, 13 vs. Coyle & Cassidy, 1 – Final – Delaney Powell capped off the season for Taunton with five goals and an assist to lead the Tigers to a seventh win on the season. Abbey Kingman added two goals and two assists and Bre Conlon and Annie Tate also had a pair of goals apiece. Hannah Moniz and Rosemary McGrath also scored for Taunton. King Philip, 3 @ Franklin, 2 – Final – King Philip’s second doubles pairing of Aidan Ignatius and Marco DiStefano rolled to a straight set win over Franklin just this past Friday. Trailing 1-4 in the second set against a new Franklin duo, the pair rallied and earned a 6-2, 6-4 win and clinching the Warriors at least a share of the Kelley-Rex title. It marks KP’s first league title since 2013. Cole Ginter (first singles, 6-4, 6-1) and Martin Matous (third singles, 6-2, 6-0) also picked up wins for KP. Franklin’s Eli Brooks won 7-6 (7-5), 6-3 at second singles and James Johnston and Derek Wu earned a 6-2, 6-0 win at first doubles. Taunton, 4 vs. Coyle & Cassidy, 1 – Final – Taunton recorded its second victory of the season over in-city rival Coyle. Sophomore Brett Beaulieu won 6-0, 6-1 at first singles, junior Mike Briggs recorded a 6-1, 6-0 win at second singles and senior Eric Gwozdz prevailed 7-6 (7-5), 6-2 at third singles. The team of sophomores Dylan Kullas and Charlie Fiske capped the win with a 6-0, 6-0 sweep at first doubles. Milford, 0 @ Foxboro, 5 – Final – Foxboro lost a total of three games in singles play and just five in doubles play in a clean sweep of the visiting Scarlet Hawks. Sophia Prinos (first singles) and Lexi Nelson (second singles) both won 6-0, 6-0 while Julia Muise took a 6-0, 6-3 decision at third singles. The team of Kayla Prag and Olivia Dantona won 6-0, 6-1 at first doubles and sophomore Kendall Milender and senior Jacey Nicklas notched a 6-4, 6-0 win at second doubles. Franklin, 1 @ King Philip, 4 – Final – King Philip didn’t drop a game at second or third singles and swept doubles play to earn the win and set up a winner-take-all situation on Wednesday against Taunton for the Kelley-Rex title. KP’s Erin Regnier (second) and Meghan Sepich (third) won 6-0, 6-0 in their respective singles matches. The team of Megan Davenport and Carly Adams won 6-2, 6-2 at first doubles and Corinne Palumbo and Lucy Barnard won 6-1, 6-0 at second doubles. Franklin senior Hannah Sweeney earned a 6-0, 6-1 win at first singles. Oliver Ames, 1 @ Mansfield, 4 – Final – Mansfield is tournament bound following a 4-1 win over Oliver Ames. The Hornets swept singles play with Paulina Martin earning a 6-0, 6-0 win at first singles, Sarah Doyle taking a 6-2, 6-0 victory at second singles and Elizabeth Elsner notching a 3-6, 6-4, 6-1 win at third singles. Chloe Peters and Tessa Garufi earned Mansfield’s fourth point with a 6-2, 6-3 win at first doubles. The team of Olivia Groebe and Kristin Bloumbas picked up a 6-1, 6-0 win at second doubles for OA. Sharon, 3 vs. Martha’s Vineyard, 2 – Final – Sharon scored an impressive win over two-time defending D3 State Champion Martha’s Vineyard to move to 17-0. The Eagles will look to complete a perfect regular season on Saturday against Milford. Nupur Shukla won 6-0, 6-3 at first singles, Emily Zhang took a 6-0, 6-2 win at second singles and Lulu Yuan prevailed 6-4, 6-4 at third singles as Sharon swept singles matches. Taunton, 5 @ Coyle & Cassidy, 0 – Final – Taunton won all five matches in straight sets to sweep the season series with city rivals Coyle. Olivia Sweeney won 6-2, 6-2 at first singles, Jordan Pagliuca recorded a 6-1, 6-3 win at second singles and Jillian Pagliuca took a 6-1, 6-0 decision at third singles. The team of Emily Moor and Ashleigh Eason continued their impressive campaign with a 6-1, 6-0 win at first doubles and Caroline Hebert and Jordan Martin prevailed 6-4, 6-0 at second doubles. Attleboro, 1 @ Taunton, 9 – Final – Taunton grabbed the lead with two runs in the third inning and then broke the game open with a four-run fifth inning and a three-run sixth inning. Tyler Medeiros and William DaRosa each knocked in three runs to pace the Tigers offense while Medeiros earned the win on the mound. Medeiros pitched six innings, allowing one run on two hits and one walk while fanning nine batters. Chris Gomes added three hits and three runs and Jacob Crawford had two hits and three runs scored for the Tigers. Canton, 0 @ Stoughton, 7 – Final – Stoughton senior Ryan Sullivan pitched five scoreless innings to earn his third win of the season. Justin Hutchinson went 2-for-3 at the plate with a triple, two runs scored and two RBI. Matt Gallagher and Jack Connelly each pitched a scoreless inning of relief for the Black Knights. Foxboro, 2 @ North Attleboro, 5 – Final – North Attleboro plated three runs in the third inning and added two more in the fourth inning to beat Foxboro. Junior Zach DeMattio had a big day at the plate, knocking in four runs and scoring the fifth. In the third, Nick Sinacola (infield hit) and Nate Pearce (single) reached before DeMattio brought both home with a double. DeMattio scored the third run when John Brennan drew a bases loaded walk. In the fourth, Sinacola had another single and DeMattio launched a two-run home run. Sinacola earned the win on the mound, striking out five in four innings of work with just two hits allowed. Peter Cohen allowed one run on two hits and two walks in three innings of relief. Franklin, 5 @ King Philip, 0 – Final – Franklin junior Jake Noviello tossed a complete game shutout, striking out three while scattering five hits and three walks to earn the win. Offensively, Cam Lupien had a team-high three hits and added an RBI while both Tyler Gomes and Alex Haba had two hits and two runs scored. Franklin clinched the Kelley-Rex division title outright with the win. Milford @ Sharon – Postponed to Saturday, 5/27 at 12:00. Stoughton, 10 @ Canton, 5 – Final – Stoughton took a 5-0 lead in the opening innings only to have Canton rally to tie the game in the fourth. The Black Knights regained the lead in the top of the sixth when Alessandra Loffredo beat out an infield single on a two-out grounder that plated Taylor Levine. Karly Estremera went 3-for-4 for Stoughton, scored three runs, and drove in a pair. Brianna Ferrandiz and Jordan Lyons each had two hits and Gina Carafa picked up the win with six strikeouts. North Attleboro, 11 @ Foxboro, 12 – Final (8 inn.) 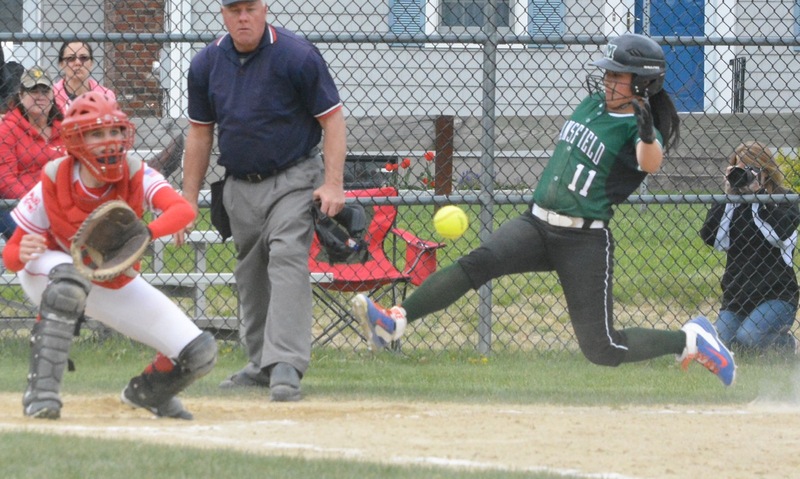 – North Attleboro’s Meg Barlow (three hits) and Bella Erti (two hits) each had a double and home run but the Rocketeers fell in extra innings. Olivia Capobianco also had three hits and Kristina Murphy and Sam Courtemanche each had two hits for North Attleboro. King Philip, 6 @ Franklin, 2 – Final – Franklin took a 2-1 lead heading into the final inning but KP rallied for five runs to earn the win. Ally Shea scored both runs for the Panthers while Alexx Niss and Clara DeCarvalho each recording an RBI. Olivia DiGiacomo added two hits for Franklin. Milford @ Sharon – Postponed to Tuesday, 5/23 at 3:00 at Milford. Mansfield, 8 vs. St. John’s Shrewsbury, 19 – Final – Mansfield was within two at halftime, trailing just 7-5, but the Pioneers pulled away in the second half. Cullen Murphy and Josh London played well defensively in front of Jack Munroe, who played well in net. Sam O’Connell and Hunter Ferreira paced the Hornets’ offense. Attleboro, 9 @ Norton, 8 – Final – Attleboro junior Ali Wall netted the game-winning goal with just four seconds left to lift the Bombardiers over Norton. Kyra Lyons, Mish Logie and Emily Patton each recorded multiple goals in the win. North Attleboro, 8 vs. Walpole, 14 – Final – Chloe Olsen and Kenzie Rosenberg each recorded a hat trick but Big Red fell to Walpole. Kaylin Moulin made 12 saves in goal while Emily Schromm and Olsen each had five draw controls. Attleboro @ Taunton – Postponed to a date and time to be announced. King Philip @ Franklin – Postponed to Tuesday, 5/23 at 3:30. Taunton, 5 @ Attleboro, 0 – Final – Taunton lost just two games in singles action and two more in doubles play in a clean sweep on the road. Olivia Sweeney won 6-1, 6-0 at first singles, Jordan Pagliuca notched a 6-0, 6-1 victory at second singles and Jillian Pagliuca grabbed a 6-0, 6-0 win at third singles. Taunton’s first doubles team of Ashleigh Eason and Emily Moor won 6-0, 6-0 at first doubles and Caroline Hebert and Jordan Martin secured a 6-1, 6-1 decision at second doubles. Canton, 4 @ Stoughton, 0 – Final – Canton swept singles play and took one more win in doubles play to beat Stoughton. Emma Sokolovsky won 6-0, 6-2 at first singles, Jamie Cree recorded a 3-6, 6-3, 14-12 win at second singles and Kiki Kavaras grabbed a 6-1, 6-0 win at third singles. The team of Julia Burkowsky and Jena Moyle prevailed 6-4, 6-4 at first doubles. The second doubles match did not finish due to rain. Foxboro @ North Attleboro – Postponed to Thursday, 5/25 at 3:00. Franklin @ King Philip – Postponed to Tuesday, 5/23 at 3:30. Sharon @ Milford – Postponed to Saturday, 5/27 at 11:00AM. Attleboro, 5 @ Oliver Ames, 1 – Final (8 inn.) – Attleboro’s offense exploded for four runs in the top of the eighth to earn a win on the road at Frothingham Park. Dylan Maskell knocked in two runs, including the game-winner, to put Attleboro ahead. Sophomore Mason Houle followed that up with an RBI single and Sam Larkin brought home the fifth run with a squeeze bunt. Drew Pagano allowed just one run on four hits in six innings of work in his first ever varsity start. Eoin Kelleher pitched two scoreless innings in relief to earn the win. Oliver Ames’ Cam Johnson reached base three times, with one hit and two walks, and also stole a base. Canton, 7 @ Sharon, 1 – Final – Canton’s Robbie Wilkinson went 6.1 innings for the Bulldogs to earn the win. King Philip @ Taunton – Postponed to Thursday, 5/18 at 3:45. Foxboro, 1 @ North Attleboro, 14 – Final (5 inn.) – With the game tied at 1-1 through three innings, North Attleboro exploded for 13 runs in the bottom of the fourth. Olivia Capobianco reached four times (three hits) and scored two runs, Andrea Miceli was 3-for-3 with a pair of runs and Abby Gallagher recorded a hit, walked, two RBI and scored two runs. Sam Courtemanche, Kristina Murphy, Liz Morehouse and Meg Barlow all finished with two hits apiece for Big Red. Bella Erti struck out six in four innings of work while Olivia DesRoches pitched a scoreless fifth inning. each had two hits for the Panthers. Taunton, 1 @ King Philip, 4 – Final – Click here for a recap of this game. Sharon, 8 vs. Ursuline, 3 – Final – Sharon had its best offensive game of the season in a win over Ursuline, sweeping the season series. Alli Small (2-for-4), Sam Marglous (3-for-3) and Clara Cook (2-for-4) each had extra base hits, an RBI and a run scored for the Eagles. Rebecca Clayman, Shoshana Lowe and Courtney Sollis all contributed with a triple each. Cook notched 10 strikeouts and scattered five hits in a complete game effort. Sharon, 20 @ Attleboro, 8 – Final – Click here for a photo gallery of this game. Oliver Ames, 2 @ Attleboro, 3 – Final – Attleboro won a pair of singles matches and prevailed with the win over Oliver Ames with a three-set win at first doubles. Shawn Gordon won 6-3, 6-4 at first singles and Abdul Khatib won 6-2, 6-0 at second singles for the Bombardiers. The team of Eli Araujo and Ryan Gordon won 6-2, 3-6, 6-2 at first doubles to clinch the win. Oliver Ames senior Danny Hanley won 4-6, 7-5, 10-4 at third singles and Jack Simone and Alex Barnett teamed up for a 6-4, 6-2 win at second doubles. Franklin, 2 @ Mansfield, 3 – Final – Franklin won both doubles matches but Mansfield swept singles play to earn the win. For Franklin, James Johnston and Derek Wu won 6-2, 6-3 at first doubles and Tyler DiPalma and Rahul Hosdurg prevailed with a 6-4, 6-2 win at second doubles. Stoughton, 0 @ North Attleboro, 5 – Final – North Attleboro defended home court with a sweep, winning all five matches in straight sets. Zac Pfeffer won 6-0, 6-2 at first singles, Daniel Zhang won 6-4, 7-5 at second singles and Alex Rinaldi prevailed 6-2, 6-2 at third singles. The team of Andrew Harris and Vikram Senthilakumaran won 6-2, 6-1 at first doubles and Mayank Wadekar and Alex Pfeffer won 6-0, 6-1 at second doubles. Taunton, 3 vs. Durfee, 2 – Final – Taunton edged out non-league rival Durfee with two wins at singles and one more at doubles. Sophomore Brett Beaulieu won 6-3, 6-2 at first singles, senior Eric Gwozdz notched a 6-1, 6-4 win at third singles and the team of sophomores Dylan Kullas and Charlie Fiske prevailed with a 6-1, 7-5 win at first doubles. Attleboro @ Oliver Ames – Postponed to Thursday, 5/18 at 3:45. Foxboro, 1 vs. Martha’s Vineyard, 4 – Final – Foxboro’s Lexi Nelson captured the Warriors lone match, winning 7-6 (7-2), 7-6 (8-6) at second singles. Mansfield, 3 @ Franklin, 2 – Final – Mansfield earned two wins in singles play and one more in doubles to defeat Franklin on the road. Junior Sarah Doyle won 6-1, 6-1 at second singles and sophomore Elizabeth Elsner took a 6-2, 6-2 decision at third singles. Mansfield’s first doubles team of Chloe Peters and Tessa Garufi won 6-0, 6-0. Franklin’s Hannah Sweeney won 6-2, 6-2 at first singles and the team of Jillian McLaughlin and Alexa Katsaros won 6-4, 2-6, 10-4 at second doubles. North Attleboro, 5 @ Stoughton, 0 – Final – North Attleboro dropped just one game in singles play and prevailed with wins in both doubles matches at Stoughton. Emily Chiasson won 6-0, 6-0 at first singles, Jordan Willis won 6-0, 6-0 at second singles and Azka Siddiq notched a 6-0, 6-1 at third singles. The pairing of Gabby Duva and Katie Demontigny won 6-3, 6-1 at first doubles and Hana Hershey and Leah Marceau teamed up for a 6-1, 6-3 win at second doubles. Taunton, 5 @ Durfee, 0 – Final – The Tigers won all five matches in straight sets, losing a total of eight games to leave Fall River with a win over the Hilltoppers. Olivia Sweeney won 6-2, 6-1 at first singles, Jordan Pagliuca notched a 6-1, 6-0 win at second singles and Jillian Pagliuca recorded a 6-0, 6-0 win at third singles. Ashleigh Eason and Emily Moor teamed up for a 6-2, 6-2 win at first doubles while Caroline Hebert and Jordan Martin didn’t lose a game in a 6-0, 6-0 win at second doubles. Canton, 61 @ Stoughton, 75 – Final – Canton’s John Guenthner and Jack Healey were both double winners; Guenthner clocking in at a personal best 15.9 in the 100M hurdles and also winning the 400M hurdles in 60 while Healey won the 1 Mile (5:00) and the 2 Mile (11:12). Other first place finishes for Canton included Steven Brady (triple jump, 39’1″), Riley McDonnell (200M, 23.8), Marquise Montes (long jump, 18’11.25″) and the 4×100 of Montes, Cordell Smith, Dan Pierre and Dan Alice. Canton, 50 @ Stoughton, 86 – Final – Canton’s Sarah Collins concluded the dual meet schedule with another two wins, taking first in the 400M hurdles (68.3) and the 800M (2:33). Other first place finishes for the Bulldogs include Nicole Brown (100M, 12.9 – a personal best), Jimisha Williams (200M, 27.1 – a personal best), Bronwyn Mahoney (shot put) and Erika Lum (high jump, 4’10”). Canton’s 4×100 of Lum, Williams, Brown and Claire Belisle) also came in first with a state qualifying time of 51.5. Oliver Ames, 68 @ Mansfield, 68 – Final – The Tigers and Hornets finished level in the final dual meet of the season. For Mansfield, Angela Corkery won the javelin with a 20-foot PR, finished second in the triple jump and was a member of the 4×100 relay (with Jordan Brill-Cass, Julia Harrison and Amanda Mangano) that finished first. Madison Haughey won both the high jump and the long jump and finished second in the 100M hurdles. Milford, 9 @ Attleboro, 5 – Final – Attleboro held a pair of leads, up 4-2 and then again up 5-4 but Milford stormed back to get the win. Kevin Cambrola earned the win in relief for the Scarlet Hawks, shutting down the Bombardiers’ offense. Ryan Goncalves, Alex Macek and Luke Allegrezza each had two hits for Milford while the Hawks capitalized on five Attleboro errors and seven walks. Canton, 0 @ Taunton, 15 – Final (6 inn.) – Taunton scored five runs in the first inning to set the tone and tacked on runs in all other innings except one to beat Canton. Christian Simoes had an impressive day at the plate, going 4-for-5 with four runs scored and three RBI to pace the Tigers’ offense. Jimmy Hoye was 4-for-4 with two RBI and two run scored, Joe Manchester was 3-for-4 with an RBI and two runs scored, Billy DaRosa had two hits and two RBI and Matt Machado had two hits and two runs scored. Sophomore Griffin Tomaszycki tossed a six inning shutout in his first career start, allowing six hits while recording six strikeouts. Foxboro, 2 @ Oliver Ames, 3 – Final (8 inn.) – Oliver Ames rallied for two runs in the bottom of the seventh inning to send the games to extra innings and won with an infield hit an inning later. Senior Cam Johnson came through with the tying hit, driving in Mitch Goulet (walk) and Kyle Gagliardi (single) to tie the game. In the bottom of the eighth, Alden Newman led off with a single, moved to second on a hit batter, moved to third on a sacrifice and beat the tag at home on an infield hit from Gagliardi. Stoughton, 3 @ Franklin, 4 – Final – Franklin sophomore Jake Macchi delivered a double in the bottom of the sixth inning, knocking in classmate Alex Haba for the go-ahead run to break a 3-3 game and give the Panthers the lead. Bryan Woelfel earned the save with a scoreless seventh inning. Junior Jason Ulrickson earned the win following a tremendous outing, striking out 10 while allowing just four hits and two walks. Jake Lyons added a double and a run scored for Franklin. Ruben Gonzalez was 2-for-3 with a walk, run scored an RBI and Evan Gibb had a two-run double to tie the game for Stoughton. Sharon, 4 @ King Philip, 10 – Final – King Philip’s offense erupted for six runs in the sixth inning to break open a tie game. With the Eagles and Warriors knotted at 4-4, King Philip’s bats came to life to plate the go-ahead run and tacked on five more. Chris Wing tossed a complete game, striking out six with three earned runs allowed. Wing also collected two hits at the plate while Stephen Murray went 3-for-3 and Will Weir went 2-for-2. North Attleboro, 3 @ Mansfield, 5 – Final – North Attleboro got off to a good start wtih a run in the top of the first inning but Mansfield with three runs in the bottom half and never surrendered the lead. Big Red came back to tie the game in the top of the third, but Mansfield plated what turned out to be the game winning run in the bottom half. The Hornets tacked on an insurance run in the sixth. Kyle Moran (2-for-3, run) doubled in Colin Gibbons (two runs, RBI) for the game-winner. Zack Peterson also went 1-for-3 with two RBI for Mansfield. Nolan Dousa earned the win, striking out eight with three earned runs allowed. Attleboro, 0 @ Milford, 12 – Final (5 inn.) – Milford junior Emily Piergustavo continued to dominate at the plate, collecting three hits for the third straight game to pace the Hawks. Piergustavo was 3-for-3 with a double, home run, two runs scored and two RBI. Kaitlyn DeCapua (1-for-2) had two RBI, two runs and a walk, Kelley Reichert also knocked in two runs, Maddy Bonvino (double) reached base three times and Shannon Cormier knocked a run in for Milford. Ali Atherton allowed just two hits while striking out six in a complete game effort to earn the win. Taunton, 15 @ Canton, 0 – Final (5 inn.) – Courtney Fisher retired nine consecutive hitters, including four on strike outs, as the Tigers defeated Canton. Jaylin Couto allowed two hits, but struck out six over her two innings in relief. Jaime Brown (triple, RBI), Liana Duarte (three RBI), and MacKenzie Handrahan (double, RBI) each had two hits, while Couto blasted a three-run home run to lead Taunton’s offensive attack. Oliver Ames, 10 @ Foxboro, 5 – Final – Katie Mills, Victoria Ziner and Katie Abreu each had multiple hits and played a big role in Oliver Ames’ offensive outburst to beat Foxboro. Mills went 4-for-5 with three RBI scored, Ziner went 2-for-4 with two RBI and a home run and Abreu was 3-for-4 with a run scored for the Tigers. Lizzie Miller added two hits and a run scored, Caroline Mahoney had two hits and Rachel Han went 2-for-4 with an RBI and a run scored. Kayla Georgeu earned the win, allowing seven hits while striking out five. Franklin, 12 @ Stoughton, 2 – Final – Franklin junior Jackie Cherry retired the final six batters on strikes and notched a career-high 12 strikeouts to help the Panthers earn a win on the road. Offensively, Tara Hartnett had three RBI, Meg Caron had a pinch-hit two-run single and Alexx Niss went 2-for-4 with a triple and scored three runs. Taylor Levine and Alessandra Leffredo each drove in a run for the Black Knights and Nikki Coppola had a pair of hits. King Philip, 12 @ Sharon, 0 – Final (5 inn.) – King Philip junior Elise Pereira made her mark on both sides of the ball in the Warriors’ win. Pereira allowed just two hits in a complete game effort while striking out 10 batters. At the dish, she had two hits, including a three-run home run for KP. Meg Gorman (double) had three hits while Betsy Walsh and Sydney Phillips each had two hits apiece. Mansfield, 4 @ North Attleboro, 7 – Final – North Attleboro freshman Bella Erti scattered seven hits, struck out five and walked two, while allowing no earned runs to earn the win for Big Red. At the plate, Erti had a solo home run and a double, finishing with two RBI. Sam Courtemanche was 3-for-3 while Meg Barlow and Kristina Murphy were both 2-for-3. Abby Gallagher added three RBI for the Rocketeers and Ashley Cangiano picked up an outfield assist, throwing a run out at home from center. Kara Bendanillo drove in the first Mansfield run with a bases loaded walk in the fourth and Megan Letendre singled in a second. The Hornets added two more in the fifth on an overthrow and a wild pitch. Letendre and Marissa Staffer each had two hits for Mansfield, which finished with eight as a team. Franklin, 10 @ King Philip, 4 – Final – Franklin limited King Philip to just one goal in the first half and scored five goals in each frame to pick up a key division win. The Panthers raced out to a 5-1 lead after the first two quarters. Eric Civetti scored a game-high four goals and had one assist, Sam Arsenault scored once and had three helpers, Packie Watson notched two goals and one assist, Chase Tanner found the back of the net twice and Nitin Chaudhury had one goal and one assist for Franklin. FHS head coach Lou Verrochi praised the work of sophomore Pat Morrison, saying “he was a beast in close defense.” Connor O’Rourke made eight saves in net and sophomore Jacob Alexander won 13 of 18 faceoffs for Franklin. Foxboro, 13 @ Hingham, 12 – Final (OT) – Sophia DiCenso scored six goals, including the game-winner in overtime, to lead the Warriors to a non-league road win. Meghan Curran scored a hat trick and Sara Addeche made eight saves in the win. Franklin, 5 @ Stoughton, 0 – Final – Franklin lost just one game in doubles play and won all five matches in straight sets to beat Stoughton. James Johnston and Derek Wu won 6-0, 6-0 at first doubles and Tyler DiPalma and Rahul Hosdurg notched a 6-0, 6-1 win at second doubles. Rahul Herur won 6-2, 6-3 at first singles, Eli Brooks didn’t lose a game in a 6-0, 6-0 win at second singles and Dan Angermeier won 6-1, 6-1 at third singles. King Philip, 0 @ Sharon, 5 – Final – It was another strong performance for the Eagles, who won all five matches in straight sets. Senior Griffin took a 6-2, 6-0 decision at first singles, junior Fred Bondar notched a 6-3, 6-0 win at second singles and junior Andre Olivei recorded a 6-4, 6-4 win at third singles. The team of senior Alex Romantz and Alberto Olivei won 6-0, 6-1 at first doubles and sophomore Danujan Thirumavalavan and senior Sammy Kirshenbaum won 6-3, 6-3 at second doubles. Mansfield, 3 @ North Attleboro, 2 – Final – Mansfield edged out Big Red by sweeping all three singles matches. Senior Benny Lin won 7-5, 6-1 at first singles, sophomore Luke Nickerson took a 6-0, 6-4 decision at second singles and senior Gus Daganhardt prevailed with a 7-6, 6-1 win at third singles. North Attleboro won both doubles matches with senior Daniel Zhang and junior Ben Pfeffer taking first doubles 6-2, 6-2 and Andrew Harris and Vikram Senthilakumaran winning 7-5, 6-2 at second doubles. Milford, 5 @ Attleboro, 0 – Final – All matches were competitive but Milford prevailed with a sweep, winning all five in straight sets. Julie Rabinowitz won 6-0, 6-2 at first singles, Allison Buckenmaier won 6-3, 7-5 at second singles and Caitlin Carafella won 6-1, 6-3 at third singles. The team of Victoria Beyer and Daniella Arojo won 6-4, 6-4 at first doubles and the team of Ashlyn Oliveri and Angela Pillarella won 7-5, 6-1 at second doubles. Canton, 0 @ Taunton, 5 – Final – Taunton first singles player Olivia Sweeney won her 58th career match, setting a new program record as the Tigers swept Canton. Sweeney won 6-0, 6-4 while Jillian Pagliuca won 6-3, 6-0 at second singles and Vanessa Rosa won 6-2, 3-6, 10-6 at third singles. The team of Emily Moor and Ashleigh Eason won 6-1, 6-0 at first doubles and the team of Jordan Martin and Caroline Hebert won 6-1, 6-1 at second doubles. Foxboro, 5 @ Oliver Ames, 0 – Final – Foxboro won all five matches in straight sets to bounce back from just its second loss of the season. Junior Sophia Prinos won 6-0, 6-0 at first singles, senior Lexi Nelson won 6-0, 6-2 at second singles and junior Kayla Prag took a 6-3, 6-4 decision at third singles. The team of juniors Morgan Krockta and Olivia Dantona won 6-3, 6-1 at second doubles and sophomore Kendall Milender and senior Jacey Nicklas earned a 7-5, 6-0 victory at second doubles for the Warriors. Stoughton, 1 @ Franklin, 4 – Final – Franklin seniors Madison Derby and Julia Hogan won a tightly contested match at first doubles in a 10 set tiebreaker to punctuate the Panthers’ win over Stoughton. Derby and Hogan won 7-5, 5-7, 10-6 while juniors Hailey Strier and Jillian McLaughlin won 6-3, 6-1 at second doubles. Hannah Sweeney didn’t lose a game in a 6-0, 6-0 win at first singles and senior Anja Deric won 6-0, 6-2 at second singles. Stoughton senior Ally Swartz won 6-4, 6-0 at third singles for the Black Knights. Sharon, 5 @ King Philip, 0 – Final – Sharon’s three singles players didn’t lose a single game in a dominating performance on the road. Nupur Shukla (first singles), Emily Zhang (second singles) and Lulu Yuan (third singles) each won 6-0, 6-0. The team of Katie Merport and Emily Wen won 6-3, 6-1 at first doubles and Rithika Neti and Sophia Fein teamed up for a 6-2, 6-1 victory at second doubles. North Attleboro, 5 @ Mansfield, 0 – Final – North Attleboro won all five matches in straight sets with its first doubles pair winning without dropping a game. Katie Demontigny and Azka Siddiq won 6-0, 6-0 at first doubles for Big Red. Emily Chiasson won 6-1, 6-1 at first singles, Jordan Willis won 6-0, 6-1 at second singles and Gabby Duva recorded a 6-2, 6-4 win at third singles. Hana Hershey and Shiobhi Nandi capped the win with a 6-3, 6-1 victory at second doubles. Canton, 3 @ Milford, 11 – Final – Milford scored two runs in the first and another run in the second, but really broke the game open with eight runs in the fifth inning. The Scarlet Hawks erupted for 14 hits as a team with five players recording at least a pair of hits. Aidan Wilde and Zack Tamagni each had two hits, two RBI and two runs scored for Milford. Nate Irwin got the win, striking out four in five inning sof work with one earned allowed on five hits. Foxboro, 0 @ Stoughton, 1 – Final – Stoughton took advantage of a lead off walk in the second inning, turning it into the lone run of the game. Sophomore Evan Gibb drew the walk and eventually scored on a sacrifice fly from Ruben Gonzalez. Stoughton senior Ryan Sullivan threw a complete game shutout, scattering three hits with just one walk, fanning three batters for the win. Foxboro’s Aaron Wentling had a strong outing on the mound, allowing just five hits while striking out five in six innings of work. Oliver Ames, 9 @ King Philip, 4 – Final – Oliver Ames overcame an early 2-0 deficit, taking a 3-2 lead in the third inning. The Tigers then tacked on three runs in each of the fourth and fifth innings to create a big lead. Kyle Gagliardi went 3-for-5 with an RBI to lead OA while Alden Newman was 2-for-4 with two RBI. Head coach Joe Abarr noted Newman also had a terrific game defensively as well. Senior Sam Burr threw 6.1 innings, striking out three without issuing a walk, giving up three earned runs on eight hits. 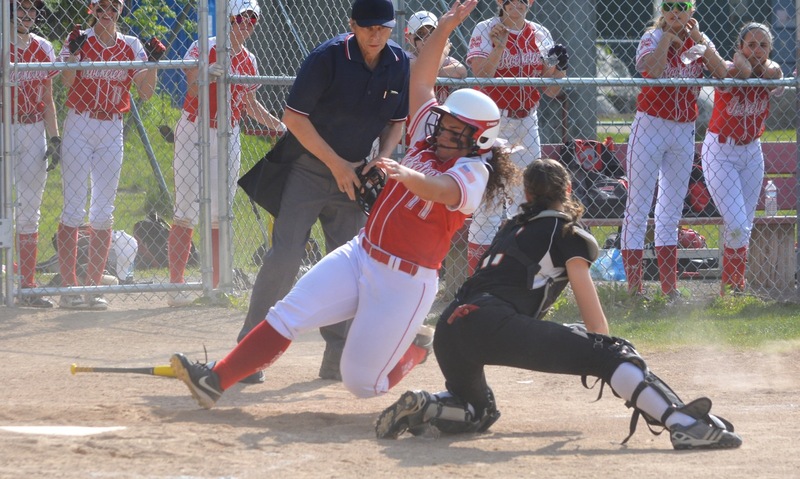 Sharon, 0 @ North Attleboro, 8 – Final – North Attleboro’s offense got going early, plating a pair of runs in the first while tacking on single runs in the third and fifth innings. Big Red broke the game open with a four-run sixth inning. Junior Nate Pearce tossed a complete game shutout on just 74 pitches, allowing three hits while striking out four batters to earn the win. At the plate, Pearce was 2-for-3 with a pair of doubles and pair of RBI. Nick Crawley went 2-for-2 with a sacrifice fly, finishing with three RBI and Jeff Gale added three hits for the Rocketeers. Mansfield, 5 @ Attleboro, 4 – Final – Sarah Cahill picked up the win for the Hornets, allowing seven hits and had five strikeouts. Sarah Bradley went 2-for-2 to lead the Hornets offensively and Liz Mackin, Kerran Holmes, Hayley McGowan and Caty Demassi all had hits in the win. Amanda Giambanco made a big play in right to double up a runner on third to end the sixth inning. Milford, 21 @ Canton, 0 – Final (5 inn.) – Milford’s Ali Atherton and Maggie Farrell each knocked in five runs as Milford rolled to a big win. Atherton went 3-for-3 with a pair of triples and five RBI while Farrell was 2-for-4 with a three-run home run, a triple and five RBI. Emily Piergustavo went 3-for-3 with a double, triple, two walks and five runs scored while Kate Irwin also went 3-for-3 with a double and four runs scored. Stoughton, 2 @ Foxboro, 3 – Final – Hannah Davis provided a walk-off hit in the bottom of the seventh inning to give Foxboro the win in its delayed season opener. Jamie Gorham led off the inning with a base hit and was moved into scoring position by a Kelly McCarthy bunt. Davis ripped a hit to left to score the winning run. Kelly Fisher had two hits and two RBI for the Warriors and Emma Rohan went the distance for the win. Gina Carafa gave up only one earned run in 6-2/3 innings for the Black Knights. Taunton, 10 @ Franklin, 3 – Final – Courtney Fisher allowed one earned run to pick up her fifth win of the season. Kya Enos had a home run and a double and drove in three runs for the Tigers, while Hailey Medeiros had a double, triple, and two RBI and Katie Van Zandt had a pair of hits. Eighth grader McKenzie McAloon added her first career varsity hit and RBI in the win. King Philip, 6 @ Oliver Ames, 1 – Final – Oliver Ames scored in the first inning and loaded the bases in the second, but couldn’t add any more damage as KP picked up the win. OA’s Victoria Ziner was 2-3 with a pair of doubles and a run scored and Rachel Han had an RBI for the Tigers. Kayla Georgeu struck out two in a complete game effort for OA. North Attleboro, 12 @ Sharon, 1 – Final – North Attleboro junior Amelia Murphy had a big day for the Rocketeers, tossing a one-hitter with nine strikeouts to earn the win while also hitting a home run at the plate. Andrea Miceli added three hits, Meg Barlow and Liz Morehouse each had two hits and Kristina Murphy had a three-run triple for the Rocketeers. Attleboro, 1 @ Franklin, 19 – Final – Eleven different players found the back of the net as Franklin rolled to its second league win. Four players scored their first career goals for the Panthers; sophomore Cam Sweeney had two goals and one assist, junior Scott Ehrenberg (5/8 on face offs) scored once and sophomores Ben Kolb and Aaron Mollo each netted one goal. Sophomore Jacob Alexander won 14 of 16 face offs. Junior Connor O’Rourke made five saves in net and sophomore Will Davis made three saves in the cage for Franklin. Canton, 13 @ Milford, 2 – Final – Canton built a commanding 12-0 lead by halftime to pick up a win over the Hawks. Ryan Lodge led all scorers with four goals and three assists for the Bulldogs. Junior Joey Vaughan and freshman James Murphy each scored their first career goals in the win. Canton’s Jack Connolly, CJ Martin, and Dylan Cunningham split time in goal and each played well according to head coach Bill Bendell. Stoughton, 2 @ Foxboro, 14 – Final – Foxboro’s Louis Piccolo scored four goals to pace the Warriors’ offense. Sam Blake added two goals while Brendan Tully had three assists. King Philip, 7 @ Mansfield, 6 – Final – King Philip scored the final two goals of the game, turning a deficit into a win over the Hornets. John DeLuca scored with four minutes to play to tie the game 6-6 and then with under two minutes to play, senior Tim Watson scored his goal of the game, which turned out to be the game-winner. Head coach Jamie Stefanini praised the team’s defensive effort, highlighting Connor Khung’s shutdown performance. Paul Macrina made 14 saves in the cage for the Warriors. Colin DeVellis added two goals for KP while Mike Curtain and Ben Palmer each scored once. North Attleboro, 11 @ Oliver Ames, 4 – Final – North Attleboro put on a dominant performance in the second half, outscoring the Tigers 7-1 to pull away and earn a league win on the road. Zach McGowan (three assists), Tommy Lindstrom (assist) and Colin Young each scored a pair of goals to pace the Rocketeers’ offense. Dan MacDonald and Jack Dakin each had a goal and an assist while Owen Costello and Andy DeMattio each scored once. Hunter Sarro and Nick Moore each recorded an assist. North Attleboro’s Jack Puccio (four saves) and Jake McNeany (five saves) split time in the cage for North. Franklin, 19 @ Attleboro, 0 – Final – Eleven players scored a goal in Franklin’s win and 13 players recorded at least a point for the Panthers. Hailey Toolin had three goals, Grace Platner and Kelsey MacCallum each had two goals and a pair of assists and Lauren DeStefano had four draw controls for Franklin. Taunton, 0 @ Franklin, 5 – Final – Franklin senior Rahul Herur won a competitive match at first singles while the Panthers won all five matches in straight sets. Herur won 7-5, 6-2 while Eli Brooks won 6-1, 6-1 at second singles and Rohan Herur won 6-0, 6-0 at third singles. James Johnston and Derek Wu won 6-0, 6-0 at first doubles and Tyler DiPalma and Rahul Hosdurg won 6-3, 6-0 at second doubles for the Panthers. King Philip, 5 @ Oliver Ames, 0 – Final – King Phillip won all five matches in straight sets, only dropping one single game in an impressive performance. Cole Ginter and Blake Ginter won 6-0, 6-0 at first and second singles, respectively while Martin Martous won 6-1, 6-0. The doubles teams of Ryan Gemelli and Sam Collella (first doubles) and Aidan Ignatius and Marco DiStefano (second) both won 6-0, 6-0. North Attleboro, 1 @ Sharon, 4 – Final – It was a clean sweep in singles play for the Eagles, who got another win at first doubles. Senior Griffin Fein won 6-2, 6-2 at first singles, junior Fred Bondar won 6-1, 6-1 at second singles and Danujan Thirumavalavan won 6-1, 6-1 at third singles. The team of senior Alex Romantz and freshman Alberto Olivei won 6-1, 6-0 at first doubles. North Attleboro’s Andrew Harris and Vikram Senthilakumaran won 6-1, 6-4 at second doubles. Attleboro, 1 @ Mansfield, 4 – Final – Mansfield senior Paulina Martin won in straight sets without dropping a single game at first singles to pace the Hornets. Junior Sarah Doyle won 6-0, 6-3 at second singles and Elizabeth Elsner won 6-3, 6-1 at third singles for the Hornets. Senior Chloe Peters and sophomore Tessa Garufi won 6-2, 6-0 at second doubles for Mansfield. Attleboro senior Katie Furtado and Brooklyn Palermo won 7-6, 6-3 at second doubles. Foxboro, 5 @ Stoughton, 0 – Final – Foxboro notched a clean sweep, winning all three singles matches without losing a single game. Sophia Prinos, Lexi Nelson and Julia Muise each won 6-0, 6-0 at first, second and third singles, respectively. Kayla Prag and Olivia Dantona won 6-3, 6-2 at first doubles and Kendall Milender and Morgan Krockta won 6-1, 6-3 at second doubles. Sharon, 3 @ North Attleboro, 2 – Final – Sharon won all three singles matches in impressive fashion while the Rocketeers won both doubles games. Sophomore Nupur Shukla won 6-0, 6-0 at first singles, freshman Emily Zhang won 6-1, 6-1 at second singles and junior Lulu Yuan won 6-0, 6-0 at third singles. North’s Gabby Duva and Azka Siddiq won 6-1, 6-2 at first doubles and Katie Demontigny and Hana Hershey rallied to win 5-7, 6-1, 7-6 (10-8) at second doubles. Taunton, 1 @ Barnstable, 3 – Final – Taunton suffered its first loss of the season, losing 25-21, 26-24, 17-25, 25-20 to Barnstable. Lens Esquil had 14 kills, two blocks and an ace while Lance Law had 14 kills, two aces and a block for the Tigers. NORTH ATTLEBORO, Mass. – After losing star pitcher Meg Colleran and a host of seniors, North Attleboro coach Bill Wallace knew that 2015 would be a rebuilding year for the program. The additional loss of shortstop Mycala Moody to injury only added to a long spring. Coming into this season, the Rocketeers returned seven starters, including a healthy Moody, and added sophomore KP transfer Amelia Murphy in the circle. The expectation was a for a quick return to the tournament and on Friday afternoon North fulfilled that goal secured its place in the postseason. Behind a four-hit, three-RBI day from Moody in the leadoff spot and three RBI from No. 2 hitter Jordan Sharpe, North beat Stoughton 13-2 for its ninth win of the season. The North offense was clicking with Moody setting the tone in her first at-bat with a hard grounder through the infield that was missed by the right fielder allowing her to take third. Sharpe brought her home with a groundout and North had a 1-0 lead. The Rocketeers would have 18 hits as a team against Stoughton pitchers Shannon Flaherty and Gina Carafa and every batter in the starting lineup had at least one. In addition to Moody’s 4-for-5 day, Liz Morehouse went 2-for-4, Kaylea Sherman went 2-for-3 with a walk, Amelia Murphy was 2-for-2 with a walk, and No. 9 hitter Gina Miceli chipped in with a 2-for-3 day and reached base three times. Stoughton had seven hits, three of them in the four innings that Murphy pitched, but the Black Knights showed a lot of pop at the plate. Unfortunately for the visitors, a lot of those line drives went right at North players, including shots to Sherman in center and Sharpe in right in the opening inning and a line drive ripped to Moody at short that she turned into a game-ending double play by picking off a runner at first. The Rocketeers broke the game open in the third with four runs. Sherman had an infield single to start it and Murphy followed with a singe to left. Kristina Murphy bunted past the charging third baseman to load the bases. Megan Barlow hit a sac fly to left for the first run, Sam Courtemanche had a squeeze bunt to plate the second, Miceli’s infield single scored the third and Moody lined a single to center for the fourth. The offensive outburst continued in the fifth. North sent 12 batters to the plate and scored seven runs to put the game out of reach. A Morehouse single and an Amelia Murphy double put two in scoring position with one out and Kristina Murphy singled to bring one run in. A fielder’s choice reloaded the bases and a wild pitch scored another run. After a walk loaded the bases for a third time, Moody doubled down the left field line for a pair of RBI and Sharpe followed it with a single to right center for two more runs. North led 12-0 after four innings. Stoughton did not give up. Abby Warren came in to relieve Murphy in the circle after the starter had to leave for a family event and the Black Knights got on the board. A walk to Taylor Levine and an infield single by Jenivieve D’Andrea put two on with no outs and Samantha Tullis followed with an RBI single to center. Jordan Lyons reached on a fielder’s choice and Brianna Ferrandiz smacked a single to right center that scored one, but Tullis slipped rounding third and was caught in a rundown for the first out. North tacked on an insurance run in the sixth with Morehouse’s infield single bringing in Moody who had led-off with a hit and stolen second. The Black Knights came into the game on a four-game win streak and had already clinched a playoff berth, their first since 2012. Norton was happy to see his team ensure tournament qualification in his first season as head coach. Stoughton (10-8, 7-7) will travel to Milford on Tuesday. North (9-8, 8-7) will host Attleboro on Monday afternoon. Stoughton, 12 @ Attleboro, 4 – Final (5.5 inn.) – Stoughton’s offense came to life, plating nine runs in the first five innings and tacking on three more in the top of the sixth before the game was called due to the weather. Ryan Sullivan went 2-4 with two RBI and two runs, Joe Piana went 2-4 with two runs and three RBI, Pat Hagerty contributed a clutch 2-out two RBI single, scored a run, and stole a base, Jack Connelly had a stolen base as well, with two walks and two runs scored and Luke Johnson scored three runs and had a double and RBI. Shortstop Doug Seaman played well defensively, overcoming the elements to record five assists and a put out with no errors. Nico Parmeggiani got the win on the mound, going five innings, allowing four runs (three earned) on just three hits with three strikeouts. Franklin, 0 @ Canton, 2 – Final – Kevin Powers got the win on the mound for the Bulldogs, going the distance by tossing a complete game, giving up six hits while striking out three and issuing just one walk. Powers helped his cause at the plate, going 2-4 at the plate with an RBI. Jim Jenkins was 2-3, Mike McMahon was 1-3 with the run scored in a stolen base and junior Kevin Monagle had two hits for Canton. Mansfield, 5 @ Foxboro, 6 – Final – Aaron Wentling earned the win, pitching six innings and senior Nick Wright came in to pitch the seventh inning for the save. Both AJ Bubencik and Jesse Galanti had two RBI singles for the Warriors. Oliver Ames, 2 @ King Philip, 5 – Final – With the game knotted 2-2, the Warriors plated three runs in the fifth inning to break open the game. Jake Cavanagh threw a complete game for the Warriors, scattering eight hits and striking out six. King Philip’s defense played error free and the offense belted out nine hits. Jon Rolfe went 3-3 on the day with an RBI while Jake Lannigan and Jack DiCenso each knocked in a pair of runs for the Warriors. Ryan Adams and Matt Mancini each had two hits for the Tigers. Milford, 0 @ Taunton, 3 – Final (5 inn.) – In a rain shortened game, the Tigers took advantage in the first and fourth innings to get the win. Sophomore Christian Simoes smacked a two run double in the first inning, scoring Matt Machado and Max Bowden. Senior Kevin Griffin added an RBI single in the fourth, knocking in sophomore Joe Manchester (hit, stolen base). Senior Luke Figueira improved to 5-0 on the season, throwing five innings, striking out six with just two hits allowed. Sharon, 7 @ North Attleboro, 5 – Final (6 inn.) – Sharon took advantage of a five-run second inning to get the win in a rain shortened game. Mark Botaish reached base four times, going 2-2 with a double, Aiden Arnold had a three-run double and Spencer Singer went 2-3. Andrew Filipkowski gave up two hits in 2 2/3 innings in relief for save. North Attleboro’s John Brennan had a double and a home run, knocking in four runs for the Rocketeers. Attleboro, 6 @ Stoughton, 7 – Final – Stoughton scored four runs in the bottom of the seventh inning to pull out the win, which was capped by Shannon Flaherty’s walk-off single to right. Flaherty also picked up the win in the circle after pitching a scoreless seventh in relief of Gina Carafa, who had allowed three earned runs in six innings.Jordan Lyons went 2-4 for the Black Knights and scored a pair of runs. Carafa, Courtney Campbell, and Bri Ferrandiz each went 2-3 for Stoughton. Franklin, 14 @ Canton, 2 – Final – Franklin broke the game open with an eight run third inning, tacking on five more in the final two innings after scoring one in the opening game. Alexx Niss went 3-4 with two RBI, a triple, and three runs scored, Olivia DiGiacomo went 4-5 and knocked in four runs and Olivia Haba, Julia Arms and Alyssa DaSilva combined for five RBI. Courtesy runner Kerry Blaney scored three runs for the Panthers. Emily Sawyer tossed a complete game, striking out four to earn the win. Mansfield, 8 @ Foxboro, 5 – Final – It was a game to remember for freshmen twin sisters Mady and Kara Bendanillo. Mady went 4-4 at the play with two runs knocked in and Kara added three hits, knocking in two more runs. Liz Mackin also knocked in a pair of runs on two hits and Rachel Carafa had one RBI and two hits. Megan Letendre, Maddie Letendre, Marissa Staffier and Jocelyn Reardon all had a hit each for the Hornets, who totaled 16 hits. Maddie Letendre got the win for Mansfield, surrendering five hits while striking out 13. King Philip, 10 @ Oliver Ames, 0 – Final – Oliver Ames freshmen Kayla Georgeu kept King Philip’s high powered offense in check through five innings but the Warriors exploded for eight runs in the the sixth inning. Christa Wagner had three hits while Meghan Gorman, Sydney Phillips and Elise Pereira each had a double in the sixth inning. Kali Magane struck out 11 to earn the win. Jamie Gottwald, Victoria Ziner, Caroline Mahoney (double), Missy Krim and Emma Papargiris each had a hit for Oliver Ames. North Attleboro, 10 @ Sharon, 0 – Final – Amelia Murphy threw her first career perfect game and helped her own cause offensively, scoring three runs. Kristina Murphy paced the Rocketeers’ offense, going 3-4 with a home run and five RBI. Jordan Sharpe had three hits, Gina Miceli and Liz Morehouse each had two hits and Mycala Moody had eight assists defensively. Canton, 9 @ Oliver Ames, 2 – Final – Canton jumped out to an 8-0 lead on its way to a win over the Tigers. Head coach Bill Bendell said Chris Albert and Dylan Cunningham both played well in the cage and added seniors Dan Nadeau and Ben Berkowitz stood out on defense. North Attleboro, 6 @ Franklin, 11 – Final – Franklin held a two goal lead at halftime (5-3) and went on to score six second half goals. Eric Civetti had five goals and an assist and Austin Kent Scored twice with one assist. Justin O’Callahan pitched in with three assists and freshman Jacob Alexander won 17/21 faceoffs. King Philip, 5 @ Mansfield, 8 – Final – Mansfield goalie Sean Powers was strong in the cage, helping the Hornets edge the Warriors. Hunter Ferreria and Ryan Smith each scored twice for Mansfield while Cullen Murphy, Connor Finerty and Sam O’Connell each scored once. Both Grant and O’Connell also had an assist for the Hornets, who led 4-3 at halftime. King Philip’s Tim Watson scored twice and had one assist while Harry Fallon, Sam Agricola and Anthony Truini each scored once for the Warriors. Oliver Ames, 6 @ Canton, 12 – Final – Mary Nee led the Bulldogs, scoring twice and adding one assist in the win. For Oliver Ames, Sofia Masciarelli and Hannah Friend each scored twice while Carly Cidado and Erin Fitzgerald scored once. Franklin, 13 @ North Attleboro, 9 – Final – Franklin freshman Annie Walsh paced the offense with four goals while Julia Jette had two goals and two assists and Caroline Lounsbury scored once and had one assist. Head coach Kristin Igoe said Dana Lewandowski played well on defense with two draws and two ground balls. MANSFIELD, Mass. – Heading into the seventh of Monday afternoon’s Kelley-Rex match-up, Mansfield pitcher Maddie Letendre had 10 strikeouts but had only one inning in which North Attleboro failed to put at least one runner on base. Letendre struck out the lead-off hitter and got a fly ball to the left fielder and it looked as though she would cruise through the frame and seal the win. But, Megan Barlow lined a two-out triple to left and then scored on an error that allowed Sam Courtemanche to reach. Gina Miceli slapped a single over the shortstop to put the tying run on base. The Rocketeers’ lead-off hitter Mycala Moody was up next, but her bunt down the third base line was fielded cleanly by Kara Bendanillo to close out a 5-3 victory for the Hornets, which moves them into a tie for third in the division. Maddie Letendre finished with 11 strikeouts, but also allowed nine hits and a walk against a pesky North Attleboro lineup that saw seven different players record base hits. In the end, Letendre only allowed two earned runs and worked out of a number of jams to get the Hornets’ fourth straight win. North Attleboro coach Bill Wallace saw his team leave 13 runners on base, including nine in scoring position, and that proved to be decisive. After North left two on base in the top of the first, Mansfield took the lead in its trip to the plate. Freshman Madyson Bendanillo singled to right to start the inning and after a strikeout, her twin sister Kara walked. North pitcher Amelia Murphy got a comebacker for the second out, but Rachel Carafa blasted a two-out double into left to plate both Bendanillos. The Rocketeers answered back in the second. Kristina Murphy singled to lead-off and, after Letendre struck out the next two batters, Miceli, who had a pair of singles and reached base all four plate appearances, singled to left. Moody walked to load the bases and Jordan Sharpe came through with a single that scored two and tied the game. It was not tied long. Brianna Homer started the third with a single to center and Jocelyn Reardon reached on a fielder’s choice. Liz Mackin dropped down a perfect sacrifice bunt to move both into scoring position for Madyson Bendaillo, who lined a triple into left field to clear the bases. Bendanillo came in with the fifth Hornets run on a ground out by classmate Megan Letendre. Mansfield nearly added a sixth in the third inning, but Carafa was thrown out at the plate by centerfielder Kaylea Sherman trying to score from second on a single by Homer. Murphy allowed at least one base runner every inning, but seemed to settle into her start after the second inning. She finished with five strikeouts and allowed 11 hits, but only two hits over her final three innings of work. North had a golden opportunity to cut into the lead in the fourth inning. Courtemanche doubled and Miceli and Moody each reached on fielder’s choices to load the bases with just one out and bring the coach out to speak with Letendre. The senior pitcher caught Sharpe looking after a prolonged at-bat and then got Liz Morehouse to pop up to third to end the inning and escape the jam. In the sixth, North had two on with one out, but again Letendre got a big strikeout and then a grounder to second to end the threat. After a rough week in which North lost to league leaders Taunton and King Philip, the Rocketeers are in the midst of another challenging stretch against division rivals. Wallace is pleased with the confidence that his team has shown against tough opponents. North Attleboro (3-3, 2-3) will try to bounce back against Franklin on Wednesday. Mansfield (4-2, 2-2) will try to keep the momentum going when Attleboro visits Wednesday afternoon. Attleboro, 4 vs. Dartmouth, 8 – Final – Dartmouth plate all eight of its runs in the second inning to get the win. Attleboro rallied to cut the deficit in half with four runs in the fifth inning. Nate Tellier drove in three runs with a triple and Will Carter had an RBI single for the Bombardiers. Franklin, 6 @ Abington, 3 – Final – Alexx Niss had four hits to help pace the Panthers’ offense. Niss was 4-4 with a single, double and a pair of home runs, driving in four runs. Alyssa DaSilva was 2-3 with a double and an RBI and Olivia DiGiacomo was 2-3 with a pair of runs scored. Maddie Connelly had six putouts at second base and head coach Kate Fallon-Comeau noted Olivia Haba’s strong defense in the outfield. North Attleboro, 3 vs. Durfee, 1 – Final – Amelia Murphy didn’t allow an earned run and struck out seven to get the win. Gina Miceli scored on a hit from Jordan Sharpe and then Liz Morehouse drove in Sharpe. Kristina Murphy had a solo home run in the sixth inning for the Rocketeers. Foxboro, 13 vs. Whitman-Hanson, 10 – Final – Louis Piccolo led Foxboro’s offense with four goals while Pete Conley was the main setup guy on the day with six assists and one goal. Colin Spinney scored a hat trick and had three assists as well. Jake Addeche made eight saves in net for the Warriors. Franklin, 11 vs. St. John’s Prep, 2 – Final – Austin Kent scored six goals to lead the Panthers to the win in the consolation game of the Creator’s Crosse Tournament at Lincoln Fields in Lexington. Nitin Chaudhury, Sam Arsenault, Chase Tanner, and Eric Civetti added goals for Franklin, while goalie Connor O’Rourke made 12 saves. Mike Keane also made a save in the first quarter after a penalty to O’Rourke.The Panthers led 7-1 by halftime and 10-1 after three quarters. Mansfield, 9 vs. Scituate, 8 – Final – Mansfield held a 9-5 lead in the fourth quarter and was able to hold off Scituate’s late charge. Billy Grant had three goals and two assists and Connor Finerty added a pair of goals and one assists. Cullen Murphy scored once and had three assists and Hunter Ferreira, Sam O’Connell and Jon Reed each scored once. Sean Powers made 12 saves in net for Mansfield. Milford, 1 @ King Philip, 18 – Final – King Philip built a 15-1 lead by halftime and used 12 different goal scorers to get the win. Freshman Collin DeVellis led the Warriors, scoring a hat trick and recording three assists. Harry Fallon added a pair of goals and a pair of assists for King Philip as well. Freshmen Connor Galvin and Andrew Sajcak each scored their first career goals in the win.